No matter in your office or study room, the table or desk is the main furniture of office or study room. 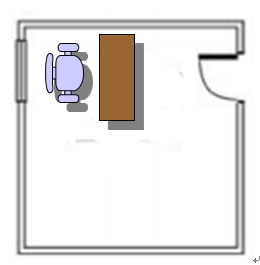 The placement of desk will decide the feng shui in the room. So let us go through feng shui tips and taboos for study and office table placement. Do not let your back face window or walkway. In that case, you back will be rushed by quick feng shui energy flow that will cause negative feng shui. 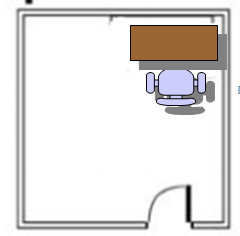 If you cannot avoid this situation, you can place some plant behind your back or replace one chair with back support. Do not place your table facing the door or window directly. As you know, the door and windows are the entry of feng shui energy Chi. We shall avoid the Chi rushing to our body directly. Meanwhile it will cause unstable feng shui energy around your study or office table and will influence your working or studying. 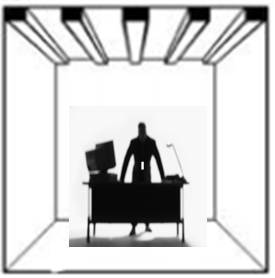 Do not place your desk close to wall and face the wall directly. In that case, the wall will become obstacles in your career or study. So it would be better to keep walking distance between your table and the wall. More space is more career development opportunities. As feng shui beginner, we know that no matter where you sit, your back should be supported by some solid objects such as wall. Those supports will give you security and confidence. 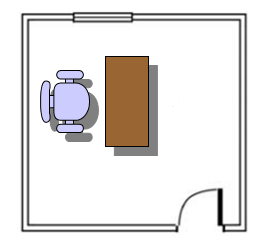 Do not align your desk with door and windows (position the table at the middle of room). No support and unstable feng shui energy environment. Avoid placing the table under overhead beam. This beam will cause stress on the people who sit under it.